We at the Center for Career Education (CCE) and our colleagues at the International Students and Scholars Office (ISSO) work collaboratively to support international students and alumni of Columbia. We encourage you to build relationships with people at both of our offices to learn about our services and resources and to understand how your visa status influences your career search. See our Find On-Campus Employment resource and visit CCE to discuss your on-campus job search strategy with a career counselor. Note that full time F-1 and J-1 students are eligible for “casual” employment on campus, which means you are paid by Columbia University. When conducting a job or internship search, review the Find an Internship or Job resource to learn how to find opportunities on LionSHARE. You can filter positions by choosing “US authorization optional” under advanced options. This is helpful to identify employers that can hire international students. It is also important to carefully review job descriptions as sponsorship information is often included. Location of the internship or job, i.e., is it in the U.S. or another country? How long you have been in full-time student status in the U.S. for positions in the U.S. Whether the position is paid or unpaid (Note: for off-campus positions in the US, any wages or other compensation like a stipend or housing requires authorization through Optional Practical Training (OPT) or Curricular Practical Training (CPT). Employers should meet all requirements of the Fair Labor Standards Act (FLSA) before you accept an internship. Learn about the six criteria for unpaid internships as outlined by the U.S. Department of Labor. If any of these criteria are not met, you should be paid. Unless you are working on campus, all internship experiences should use either your OPT or CPT. Please meet with ISSO before accepting any positions to ensure you maintain your legal status. We at the Center for Career Education are committed to partnering with employment professionals that comply with employment laws in all recruiting activities. As you conduct your job search avoid scams and fraud activity by identifying fraudulent postings. If you suspect a position or employer you encountered through LionSHARE is fraudulent, please contact us at careereducation-ear@columbia.edu. Any questions that are meant to reveal your age, race, national origin, citizenship, gender, religion, marital status, sexual orientation, or arrest records are illegal. See our resources on Illegal Questions and How to Respond. For many international students, connecting with employers and alumni can be daunting and vary widely from networking back home. A great way to start is to find alumni who are from similar backgrounds. Having an instant connection about your cultural background can help ease the nerves of networking. You’ll also gain valuable tips about how they networked effectively. Take advantage of attending events on and off campus. We also encourage you to make an appointment and practice with a career counselor, as networking is a skill that you can develop. When applying for opportunities “will you now or in the future require sponsorship” is another way companies can legally ask about your status. Answer as truthfully as possible. For example, if you are an international student on an F-1 visa and want to work in the United States after your OPT finishes then the answer to this question is yes. A company who accepts OPT and/or CPT means that they are willing to hire international students who have OPT and/or CPT. This does not necessarily mean they will provide sponsorship and it is up to you to talk to your employer about whether they sponsor in order for you to stay with the organization after your OPT finishes. Optional Practical Training (OPT) is a beneﬁt of F-1 student status that allows students to gain experience in their ﬁeld of study by applying for oﬀ-campus work authorization. To learn more about pre-completion OPT, post-completion OPT and STEM extension, please visit the ISSO website. You may use a small portion of your OPT as students to gain off-campus experience and save the remainder of your OPT time for after graduation. If you prefer not to use your OPT until after graduation, there are other ways you can supplement your experience such as joining a student organization on campus, volunteering through Community Impact at Columbia University or applying for internationally based summer opportunities abroad. Curricular Practical Training (CPT) is authorization for employment that is an integral part of the established curriculum of your degree program. CPT is not available to all F-1 students because it is dependent on the academic requirements of your program. If your school of enrollment doesn’t have an internship requirement or have an elective course that awards academic credit toward your degree, you are not eligible for CPT. Find out more about CPT by visiting the ISSO website. Also, check with your academic advisor, major department, and ISSO to determine your eligibility. Columbia Engineering offers credit-bearing (fieldwork) courses to its undergraduate and graduate students. These courses are the basis for CPT authorization for engineering students. 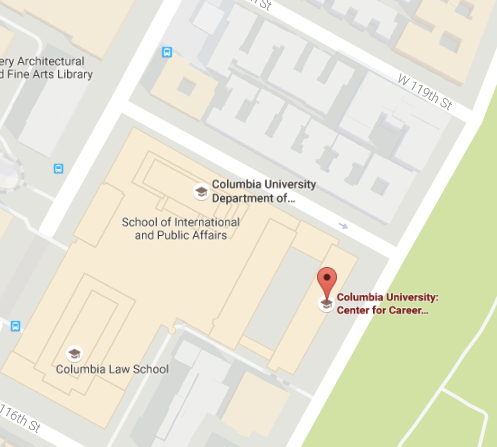 Columbia College and The School of General Studies currently do not have an academic course (credit-bearing) in place which would be the basis for CPT authorization. There are active discussions happening about CPT and Columbia College and General Studies will notify students if CPT is approved. In the meantime, international students who need employment authorization for work in the US should plan to use pre-completion OPT for summer internships, and should consult with ISSO on the process of how to do so. Employment sponsorship is when a company supports your application for an employment visa to stay and work in the US. We encourage you to explore a three-pronged approach to your career search including graduate school, opportunities in the US and global opportunities concurrently as you progress through your studies. Meet with your career counselor to discuss your plans after graduation. Oﬀers lists of employers who have sponsored visas in the past. Once logged in, go to the “H1B Info” tab at the top for the list of employers, and then utilize this list to begin searching for opportunities of interest. Provides a directory of US ﬁrms in foreign countries and foreign firms in the US. Utilize this directory to identify employers to target when searching for opportunities. Provides lists of employers who have sponsored visas in the past and other career information for international students. Find more strategies to empower you during visa process with this webinar! See where our graduate and undergraduate international alumni are.